One day out of the blue he received a call from a government official asking him to go downtown for a photo op. He wasn't told what the photo was for or why they chose him. "He had no idea he would be on the bill," his daughter said. 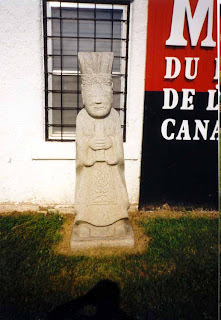 COBURG, Ont. -- Owner-operator Larry Josie says we all owe a great debt to Canada's veterans, and he fully supports the Canadian troops currently serving overseas. And it's not just lip service. 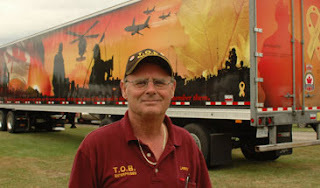 This Coburg Ont.-based trucker has created a rolling tribute to the men and women who serve Canada. First, he decorated his tractor with the names and photos of several vets, plucked from the Department of National Defense archives. 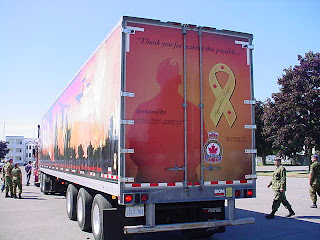 The truck is a 2005 model, which was designated The Year of the Veteran in Canada. 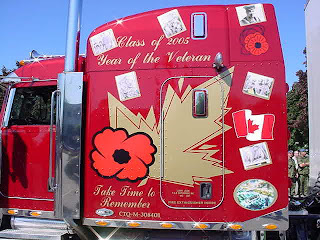 Remembrance Rig: Josie says his truck is a 'personal thank you' to all vets that have protected Canada.Recently, with the help of Sign Design, he applied these stunning graphics to one of the two trailers he owns. 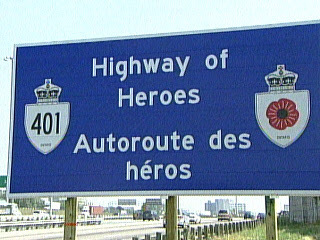 The montage shows Canadian troops in action overseas, and includes men and women from all branches of the Service. He's regularly asked to bring the truck to various Legion events, and he recently took the truck to CFB Trenton to rave reviews by fighters stationed there. He says he now being asked to attend more events than he can manage. "My truck is a personal thank you for all those people (the vets) have done for Canada in years past, and I know I'm in a small way I'm one of the benefactors of their sacrifice," Josie says. "I decided to do the trailer to send the same message to our current bunch of soldiers, sailors, and pilots. We owe them our support, and I want to make sure they know we're behind them." Josie has a regular run between Coburg, Ont. and Montreal, and the truck is easy to spot out on Highway 401 any day of the week. He also says he's looking for sponsors to support the cost of the artwork and possibly doing a second trailer. Anyone who's interested can reach Larry at 905-960-2680 or 905-372-4001. 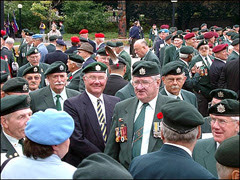 26,791 served in the Canadian Army Special Force . 1,558 were wounded, 516 gave their lives in service . Note: An additional 7,000 saw service in the UN Peacekeeping forces in Korea during the cease fire from 27 Jul 1953/55. A soldier from CFB Shilo who became the first female Canadian soldier to die in the Afghanistan mission was honoured by the Governor General on Monday. Meritorious Service Medals handed out. Goddard’s husband, Jason Beam, accepted the medal on behalf of his late wife. 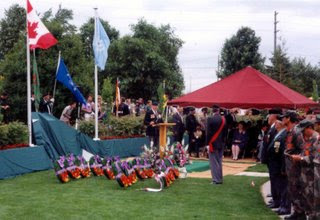 Although the decorations were created in 1993, the ceremony on Monday marked the first time that they were presented. The Governor General said the fighting in Afghanistan has exposed soldiers to the deadliest combat since Korea. Our daughter, Captain Nichola Goddard, has been portrayed in the media as a strong leader, an officer who cared for her soldiers, and one who believed in the importance of her work and of the Canadian mission in Afghanistan. She was all those things, but she was also so much more. Nichola was an avid outdoors-woman. She was an accomplished cross-country skier, and when she lived in those provinces she was a member of both the Alberta and Nova Scotia junior women Nordic ski teams. She loved camping and hiking, especially in the winter, perhaps because of her years spent living in northern Saskatchewan and on Baffin Island. She loved animals, and had two dogs and two cats she had brought from the animal shelter. She dreamed of owning a boarding kennel when she left the Army. Nichola had a huge smile, and an even bigger heart. She was a volunteer scout leader and a faithful member of the Anglican church. She was always a caring person. Once, during a ski race, a competitor became hypothermic and collapsed by the side of the track. Nichola stopped and helped him down to the finish, losing any chance of winning the race herself. After that, her friends all called her ‘care bear’. At Shilo, she agreed to shave her head as part of a Cancer Fundraiser, and her men gleefully auctioned off the right to wield the razor. She raised a lot of money. Nichola was born in Madang, Papua New Guinea, where her parents were teaching. She grew up around the world, attending seven schools before graduating from high school. She often joked that one reason she joined the Army was for the structure! Nichola spent her childhood growing up with her two sisters, Victoria and Kate, in places such as Black Lake, a native reserve in northern Saskatchewan where she won a prize for being the best Dene speaker in Kindergarten. The family then moved to Dundurn, just outside of Saskatchewan, where she learned how to ride a bike and skip rope, something she hadn’t had an opportunity to do on the reserve. Tim and Sally spent hours in the backyard turning the rope so she could practice. In Baffin Island, Nichola and her two sisters took a skidoo ride with their dad onto the ice to finally see the sun again. It was February, minus 22, and Nichola took off her snowsuit and danced in the sun. Nichola was the eldest of the three girls, and leaves to grieve her parents, her sisters, her husband, Jason, and so many more. In one of her regular letters home from Afghanistan, Nichola observed that the work of her father, an associate dean at the University of Calgary, and his colleagues in the field of post-conflict educational development was only possible because of people like her and her men. “I do what I do so you can do what you do,” she said. The family spent Christmas together and spent the holidays in Wales with Nichola’s grandmother and many members of her family. She then spent time in Sault Ste. Marie with her maternal grandparents. Before she was deployed to Afghanistan, she gathered in Calgary with her husband, parents and sisters for a weekend of family time. The one stipulation she gave before agreeing to the family weekend was that it not be a sad weekend. It wasn’t. We spoke with Nichola on Monday night. She called saying she wouldn’t be able to talk to Tim on his birthday, which was Wednesday. She was anxious to get out of the Kandahar base, as she was far happier in the hills, and was keen to get on with the job. She was never a paper pusher, she wanted to be a combat officer. She was happier outside the wire with her men. Nichola lived her life fully. She died too young, but she died doing something she believed was important, something she was good at, something she loved doing, and surrounded by people she enjoyed and respected. We shall all miss her dearly. Master Cpl. Collin Fitzgerald, who formerly served at CFB Shilo and is originally from Trenton and Morrisburg, Ont., received the Medal of Military Valour, the third ranking medal behind the Victoria Cross. 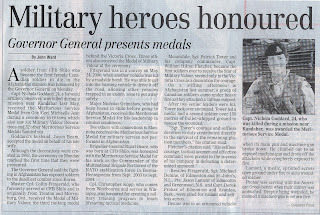 Three others also received the Medal of Military Valour at the ceremony. Fitzgerald was in a convoy on May 24, 2006, when another vehicle was hit by a roadside bomb. He was able to get into the burning vehicle to drive off the road, allowing other vehicles trapped in an enemy zone to get away safely. Major Nicholas Grimshaw, who had been based in Shilo before going to Afghanistan, received the Meritorious Service Medal for his leadership in combat conditions. Two others with connections to Manitoba received the Meritorious Service Medal for military service not performed in Afghanistan. Brigadier-General Stuart Beare, who was born at CFB Shilo, was honoured with the Meritorious Service Medal for his work as the Commander of the Multinational Brigade Northwest of the NATO stabilization force in Bosnia-Herzegovina from Sept. 2003 to Sept. 2004. Cpl. Christopher Kopp, who comes from Westbourne and serves in Winnipeg, was honoured for creating a military training program to teach lifesaving tactical medicine. Meanwhile, Sgt. Patrick Tower and his company commander, Capt. William Hilton Fletcher, became the first soldiers ever to receive the Star of Military Valour, second only to the Victoria Cross as a decoration for courage. On a stifling afternoon in Afghanistan last summer, a group of Canadian soldiers came under heavy fire as they attacked a Taliban outpost. After two senior leaders were hit, Tower took over command. Tower led a medic and a second soldier over 150 metres of bullet-whipped ground to rescue the wounded. “Sgt. Tower’s courage and selfless devotion to duty contributed directly to the survival of the remaining platoon members,” his citation read. Besides Fitzgerald, Sgt. Michael Denine, of Edmonton and St. John’s, N.L., Pte. Jason Lamont of Edmonton and Greenwood, N.S., and Capt. Derek Prohar of Edmonton and Avonlea, Sask., were cited for valiant and selfless action. Denine was in an armoured vehicle when its main gun and machine-gun broke down. He climbed out to an exposed machine-gun and drove off the attackers while completely exposed to fire. Lamont, a medic, sprinted across open ground under fire to aid a wounded soldier. Prohar was serving with the American Green berets when their convoy was ambushed. Despite being wounded, he manned a machine-gun to return fire. As of Nov 2007 we have had 73 Canadians killed and a large number wounded adding to the list of the number of causalities to date and we can only pray that this war will soon come to an end and our Boys and Girls will all be returned home safe and sound. 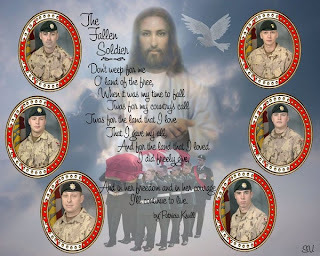 Here is the site for our fallen soldiers. I am sure some of you remember the story of these two figures that were brought back on the ship by the CO of 1 RCHA. At the time his name was Col McNaughton and when he returned back to Canada he changed his name to Col Leslie. These Songendongs (Not sure of the spelling) from talking to a Korean friend of mine Mrs Bong Jae Yim. She tells me that they were put on the site of a tomb and were supposed to protect the rich and high ranking people that had passed on. They were taken from a grave site in 1953 and were loaded on to a deuce and a half by members of the B Battery RCHA. One of those members was Len Johansson of Winnipeg. Len tells the story that they were loaded on to a ship in Busan, taken to Japan and then loaded on to a troop ship heading for Seattle, Washington and home. Upon arrival in Seattle they were transferred to a flatbed train and transported to Ontario to the home of Col Leslie who apparently had them placed at the entrance of his home. The story was also confirmed by Jim McKinny of Saskatoon Jim was a Bdr with 1 RCHA and was attached to D Battery. Jim remember an investigation going on while stationed in Shilo after they returned home but doesn't know the end results. He does know the stones were never removed from Col Leslie's property. 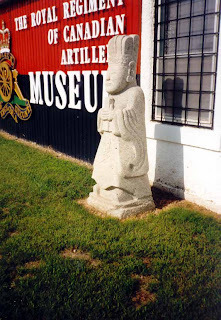 When Col Leslie passed away he had them willed to the Arty Museum in Shilo and they are standing outside the museum in Shilo at the present time. A few years ago the president of the Manitoba Korean Community, Mr Bong Jae Yim, attempted to have the figures returned to the Korean Community but was unsuccessful in his attempt to secure them for the Korean Community. They are still at Shilo but often wonder after seeing them again and thinking about them, why they are not in the Canadian War Museum in Ottawa for many to see. I am sure we will never know the true story of what happened when it was found they were here and why they were not returned back to Korea when the story got out and they ended up on the CO's personal property. The following is from someone who is more educated in the way of the Korean people and more learned than myself. He gives a very good explanation of the stones. Actually what he did was desecration of a Korean grave. It is true that notables and wealthy individuals had the more elaborate graves but the graves are respected equally with all others in Korea.The two stone icons are of scholars and they aid the deceased in the journey from life to the boundless spiritual estate beyond. They are not necessarily icons from an "antique" setting and it would not matter because in Korea there is a timelessness in assessing life. Koreans have no problem thinking back through millenia and seeing life as a continuum. They honour spirits of those departed always. The traditional Korean grave of people from high office or wealthy people - who were not necessarily bad people and likely good many times - consists of the burial mound in which the deceased has been placed in burial regalia. Close by the mound is a stone offering table. It appears like a bench, or altar, and many Canadian veterans sat on them. That, too, was sacrilege. The offering table is the place where next of kin provide the deceased with things first to help in the spiritual estate and this goes on for a long time. The descendants place rice and soju rice liquor upon the table. Sometimes they burn incense. It is not a pagan offering but necessities respectfully offered to the deceased. Every year at Chuseok Koreans go home - no matter where they are in the country. They go home by the millions to be with their family elders - all beloved to them. Central to that quest is to be at the grave of the family elders and to hold a ritual there in honour and respect and to reflect on their good fortune and love for the family and for all people. Weeks before Chuseok the family goes to the grave site. They used to always wear paper shoes to prevent desecration of the ground from contaminants they might track in - the ground is the home of the spirit and they respect it like they do the floors in their own homes where shoes are never worn. The weeds are pulled, the leaves are lifted, the grass is carefully trimmed and arranged, flowers may be planted and the area is made as clean and visually attractive as possible. I think you can see that stealing the icons from one of these grave sites - or tombs, as the Koreans call them - is a great offence. The Koreans see it not only as an offence against the family, but of all Korean people, too. Moreover, they see it as an offence against the deceased whose spirit the icons were set up to assist. Colonel Leslie's act was offensive then and the retention of those icons is offensive now to Korean people. It is too bad that hundreds of Canadian officers went to Korea knowing not a thing about the country or its people and worse - not even caring about them or their traditions or religion. This, of course, was prevalent wide scale among the men of their units for there was never any attempt made to acquaint them with these noble people. To the contrary, the Koreans generally were regaled and vilified by the very men who had gone there ostensibly to help them. Colonel Leslie was the son of General McNaughton, who was chief of the defence staff early in the war. He changed his name in order to collect an inheritance. The icons he stole from a grave in Korea were the inheritance of a family line and of the individual interred there. 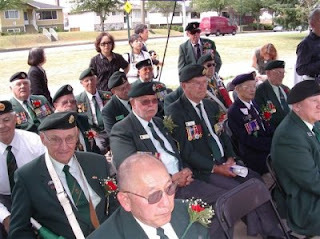 An unveiling Ceremony will take place on the lower mainland at 1:00 p.m. on Saturday 14Th of July, 2007 that may well be a first in Canadian history. Korean immigrants, now Canadian citizens, have not only raised almost one million dollars, they have built a most impressive memorial. 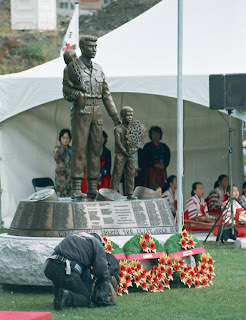 This initiative by the 60,000 strong Korean-Canadian Community based in the area of the City of Burnaby will specifically recognize the 36 servicemen from British Columbia who made the supreme sacrifice during the Korean War 1950/53 and during the Peacekeeping period 1953/56. Their names will be engraved on the Central Park Memorial (corner of Boundary Road and Kingsway Road) including rank, surname, given Names, decorations and unit. Total Canadian casualties were 516 killed, 1558 wounded and countless others suffer from post traumatic stress syndrome. Approximately 100 servicemen from British Columbia were wounded during the Korean War. Korea remains as Canada’s third bloodiest war, after WWI and WWII and, just ahead of the South African War, the last colonial war more than a century ago. Canadian servicemen and women are putting their lives in harm’s way at this very moment in Afghanistan. The Korean War, often called the Forgotten War, is worthy of a thought or two by Canadians. I respectfully ask you to look up at Mount Washington on Vancouver Island when you have the opportunity. Canadian soldiers assaulted a mountain, 1,267 meters high, the height you now ski and snowboard on Mount Washington. It was 30 March 1951, the snow was deep, it was freezing cold and, the ‘welcome wagon’ was not there to greet us. Fortunately resistance was relatively light. I weighed about 155 lbs in those days carrying about 55 lbs of equipment including a rifle, grenades, rations and an old WWII army blanket. We commenced our upward challenge about sea level. It took us about two days and one night, almost non-stop, to climb, fight and capture the mountain. On behalf of all servicemen who served in Korea, we are humbled and honoured. 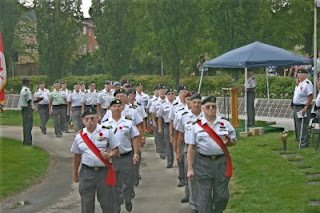 Regional President, Korea Veterans Association of B.C. Visitors admire the Memorial Wall at the United Nations Memorial Cemetery. 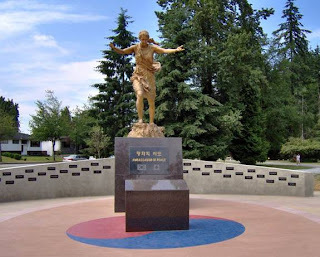 It is a beautiful Monument commemorating 40,085 service personnel from the United Nations Forces who fell during the Korean War and on peacekeeping service following the July 27, 1953 armistice. The United Nations Memorial Cemetery Korea (UNMCK) is upgrading some of the grounds. One major project is the replacement of the bases of all grave markers. Currently the bronze plaques are mounted on concrete bases, first installed more than 40 years ago. The UNMCK staff and its advisory committee plan to remount all of the bronze markers on cut charcoal gray granite plinths quarried in China. Other improvements include repaving the road around the perimeter of the cemetery.The United Nations does not fund the cemetery. The entire cost for the granite grave marker plinths and the repaving is being paid by the Government of Korea in appreciation for the brave and selfless service of all interred there. Completed last year was the Memorial Wall, a 150-meter long by two-meter high black granite wall on which are engraved the names of 40,085 United Nations servicemen who fell during the Korean War.The Memorial Wall was dedicated in October with several Veterans, Korean dignitaries and representatives from the 11 nations that have servicemen interred in the Cemetery.However, there was no appreciable international coverage of the event or of the Memorial Wall itself. Existence of the grand monument to the sacrifice of more than 40,000 of our comrades is not known by Korean War Veterans the world over.Korea Vet News has received numerous inquiries, a high number from Veterans in the United States, who are surprised (pleasantly) that the Memorial Wall exists and not so surprised (unpleasantly) that for unknown reasons information has never been disseminated about it within their country. This is the original monument dedicated to our fallen comrades of the Korea War. We thank Vince Courtney and his team for the hard work and effort put into having these monuments put in place to remember our fallen comrades of the Korea War from 1950/53/55. Dedicated by : Canada Year Dedicated : 2001 Means : It was dedicated by Canadian Veterans of the Korean War on November 11, 2001. The soldier without a hat, weapon, and unit patch will reveals individualism of Canadian and their informal characteristics. The 21 roses of Sharon and 21 maple leaves held by the boy and the girl symbolically represent 21 MIAs of Canada. 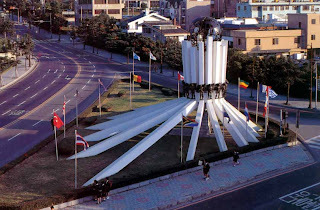 It was designed by a Canadian veteran of the Korean War, Mr. Vincent R. Courtenay, and Ken Blampied President KVA. It was sculpted by a Korean artist, Mr. Young-moon YOU. They brag about their missions and of peacekeeping days. These soldier vets are on parade; is it for veteran's plates? Or is it opening of the cairn? Or the 11th of November date? I'm proud to say you are my friend, Stormin' Norm Van Tassel! Ontario pays tribute to all of the Canadians who fell in Korean War Service. 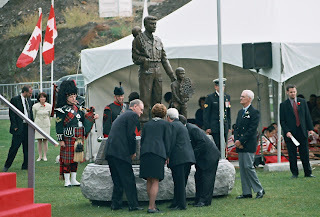 It was funded and constructed through the eforts of the Korea Veterans Association of Canada and has ben designatd as the official Canadian War Memorial. The photgraph was taken by Major ChrlsKim, from the ROK Army. Mr Kim is very much involed with the Canadian Korea Veterans Association. This Wall was dedicated on the 27 Jul 1997 and is located in Brampton, Ontario Bill Allan the founder and Chairman of the Wall Committee has been put to rest in front of the wall. 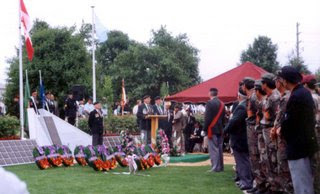 General Pitts addressing the large group of guests and spectators at the unveiling of the Wall of Remembrance in Brampton, Ont on the 27 Jul 1997. Mr Pitts served in Korea with the PPCLI and was awarded the MC as a young Plt Commander. He later commanded the Queen's Own Rifles of Canada. Norm Van Tassel is the young man wearing the sash. After the Unveiling the group being addressed by Bill Allan who was the coordinator of the project for the Wall of Remembrance. Bill served with the RCR in Korea and has since passed away. At his request his body was laid to rest in front of the wall. Rest in Peace our friend and thank you for your hard work. Left to right: Norm Van Tassel, Pres. Manitoba Unit 17, Division Commander: Gord Bennett, Skirmisher Comander, Cambridge Unit 13, Division Commander: Sam Carr, National Sgt at Arms, Pres. London Unit 4, Parade Commander: Norman Johnson, Sgt at Arms Rosemount Unit 55, Division Commander: Bob Chambers, Ontario Region 1st VP, Sgt at Arms London Unit 4, Division Commander: Wayne Allen, Niagara Falls, Commander RCL Color Guard: Don Flieger, National Pres., KVA Unit 52, Director Wall of Remembrance: Clyde Bougie, Unit 13, Founder KVA Canada & Director Wall of Remembrance. We thank Bill Allen (Deceased) and his committee for all the hard work they did in putting up this wall dedicated to those that lost their lives during and after the Korea War 1950/53/55. Bill has since passed away and his remains were placed in front of the Wall of Remembrance at his request.